[From High Holidays, 2015] After years of waiting, my advance copy of our new prayer book for the High Holidays, Machzor Mishkan HaNefesh,arrived. Truly worth the wait, the machzor is inspiring, challenging, uplifting, and spiritually engaging. 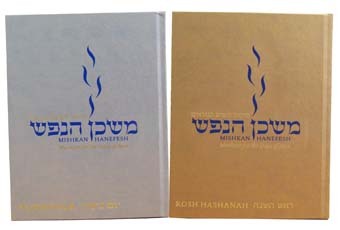 It is modeled after our Shabbat prayerbooks, Siddur Mishkan T’fila. On the right side of the page are prayers, many with introductory comments, written in Hebrew, fully transliterated English and translations that are not literal but rather capture the spirit and intent of the prayer. In my opinion the commentaries are the most meaningful addition to the machzor. They not only explain the prayers but also allow for meditation and reflection into the themes of the liturgy. I will attempt to plan services that will be familiar and yet engaging and innovative. I anticipate including more English readings because of the beautiful writings in the new machzor. I look forward to traveling on this spiritual journey with you and Mark Levy, our cantorial soloist. I hope every family will participate in donating toward our machzor fund,honoring loved ones and/or celebrating family or temple milestones.